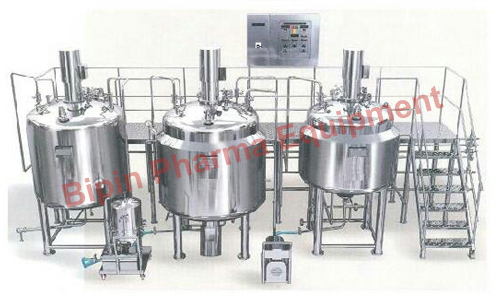 The Liquid Manufacturing Plant is a set of equipments designed for the manufacture of syrups, liquid oral formulations and other water based pharmaceutical products for capacities ranging from 500 ltrs. to 10000 ltrs. The Sugar Dissolving Vessel is a jacketed cylindrical tank with torrispherical dish ends. A propeller type stirrer is provided for agitating the liquid. The Sugar Pre Filter is a small tank that contains a mesh, through which the sugar syrup is filtered before being transferred into the manufacturing vessel. The Manufacturing Vessel is a jacketed / limpet coil cylindrical vessel with torrispherical dish ends and propeller type agitator. The vessel can be provided with a top stirrer or a bottom stirrer arrangement as per customer requirement. The Homogenizer â€“ Tank or Online is used with the manufacturing vessel to reduce particle size and promote uniform mixing. The Storage Vessel is a cylindrical tank with torrispherical dish ends in which the product may be collected and stored till it has to be transferred to the filling line. It is provided with a propeller type stirrer. Two transfer pumps (twin lobe or centrifugal) are used; one to transfer the product from the Manufacturing Vessel to the Storage vessel and another to transfer the product from the Storage Vessel to the filling line. The Vacuum System consists of a vacuum pump and inter-connecting pipeline. It is used for the transfer of sugar and sugar syrup. The Inter-Connecting Pipeline is provided for the plant as per the layout. All pipes are electro-polished from the inside. A suitable Working Platform is provided to help in the maintenance and operation of the plant. The electrical control panel houses the necessary electrical components and controls needed to operate the plant. Custom built automation can be incorporated to improve efficiency and reduce errors.